When I think of New York City, I think of its fabulous art museums and its distinctive skyline that enhances the city’s architecture and the history that lies behind each building. You could not guess that I am an art and architecture buff. 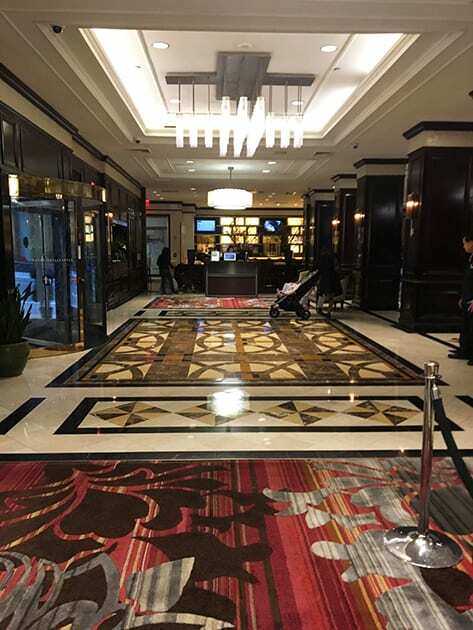 Little did I know that I would discover a wealth of history and art when I stayed at the New York Marriott East Side Hotel. 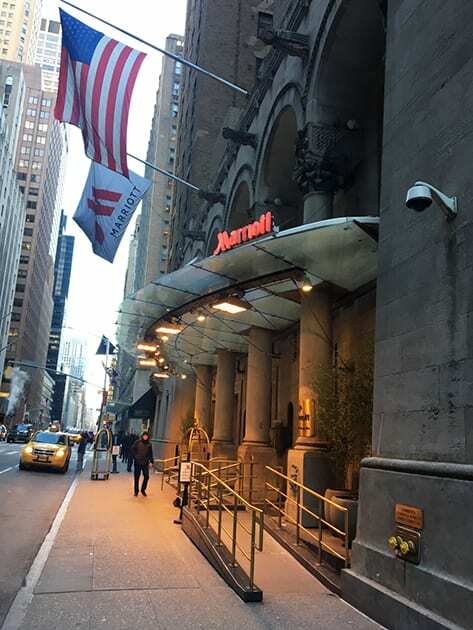 My stay this year was not my first visit to the Marriott East Side on Lexington between 49th and 50th. I stayed at the hotel in 2012, but at the time I did not know the hotel legacy. I remember sitting looking out my guest suite window at the New York skyline taking my morning Instagram photo and thinking how fortunate I was to have such an appealing view. Often in New York, the view is not the best. Little did I know that sometime in the 1920’s a famous artist enjoyed a similar vista about nine stories higher. That artist was Georgia O’Keeffe. It amazed me to find that she painted this same view only from a higher vantage point. This aspect thrilled me to no end because being an artist and an art major in college; she was one of my art idols. Her organic flowers resonated with me. The painting New York Night was one of many artworks O’Keeffe created between 1926 and 1929. O’Keeffe’s uses light in this painting to give one the feeling that the city is alive. It reflects the sense one discovers today in New York City, that the city seems to never go to sleep. O’Keeffe lived in an apartment on the 30th floor of the Shelton Hotel, now known as the New York Marriott East Side. She resided there with her husband, Alfred Stieglitz. 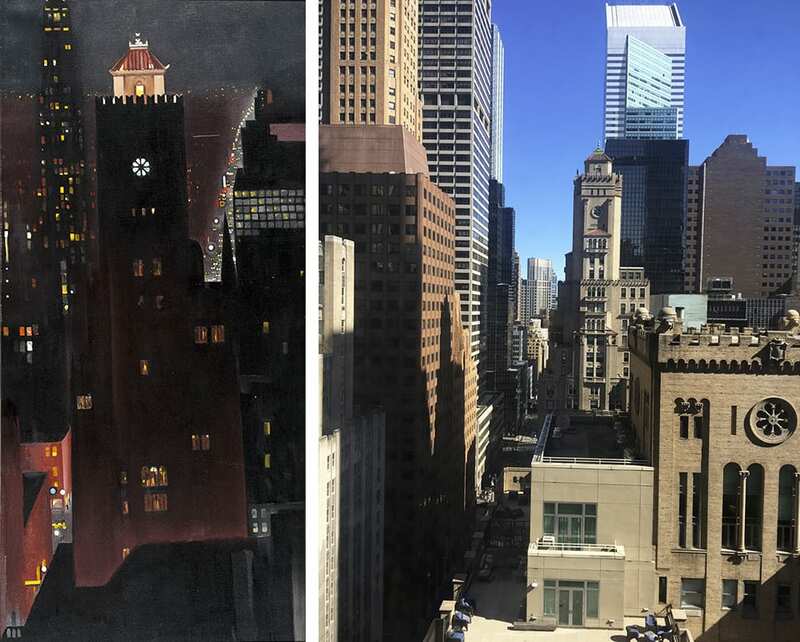 At the time O’ Keeffe created several paintings of both skyscrapers and cityscapes as she looked out the window of her apartment. One could say that many of her paintings were reminiscent of Stieglitz’s photos. New York City Skyline – New York Night by Georgia O’Keeffe (C) Sheldon Museum of Art next to my Photo of the same view from the Marriott East Side. 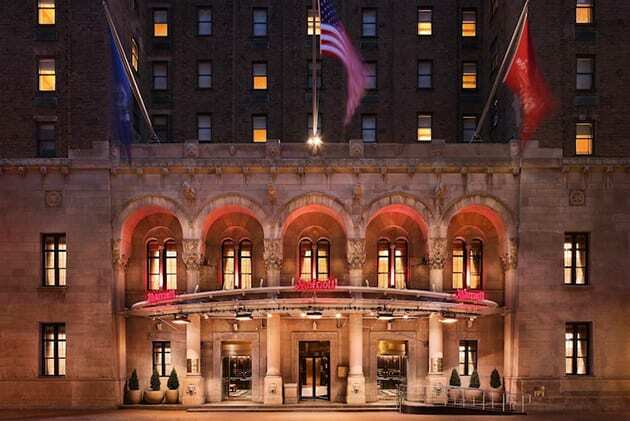 The New York Marriott East Side originally was designed by architect Arthur Loomis Harmon and opened in 1924 as a men’s residence called the Shelton Hotel. The architecture combines Romanesque and Byzantine styles. 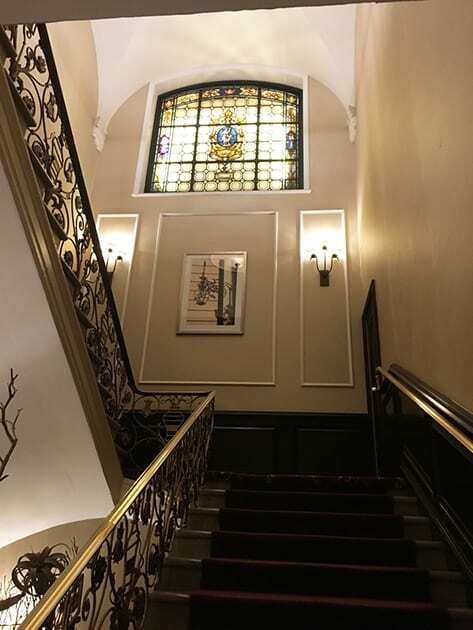 What made the hotel unusual for its time was it followed a new building code that allowed for setbacks at different heights, thus permitting light and air to flow. With the roaring twenties in full swing, the hotel had a club-like aura. The hotel featured a swimming pool, billiards room, squash courts, and dining facility. Although the pool does not exist today, it is filled with history. The pools first name to fame occurred in 1926 when Harry Houdini used the pool to perform one of his notable escapes. A sealed box was lowered into the pool. Houdini remained submerged for an hour and a half before stepping out. Later two-time Olympic medal winner in freestyle swimming and the star of Flash Gordon and Buck Rogers, Buster Crabbe taught swimming lessons in the pool. Fast forward to the 1950s when bandleader Xavier Cugat lived with his wife in the penthouse and later opened his Casa Cugat nightclub in the hotel in 1959. A short-lived venture because the club soon became Basin Street East and featured the likes of Peggy Lee and Eddie Fisher. Even Benny Goodman played at this venue. Today that room is called the Stuyvesant Room. 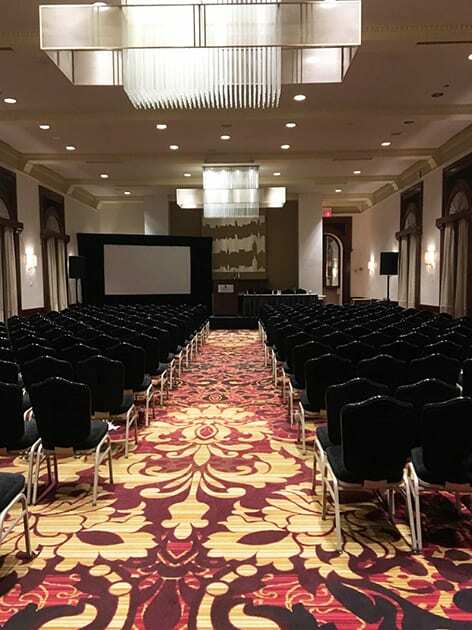 The hotel’s most recent brush with fame was when James Stare danced 330 hours on the rooftop as a charity benefit for the Muscular Dystrophy Association. Marriott took over operation of the hotel in the 1990s. Major renovations occurred in 2007. Today the hotel features 655 rooms of which 20 are suites. The most luxurious are the terrace suites. Keeping with the architecture each guest room features high ceilings and cultivates an old-world ambiance yet still maintains all the modern conveniences we all appreciate. 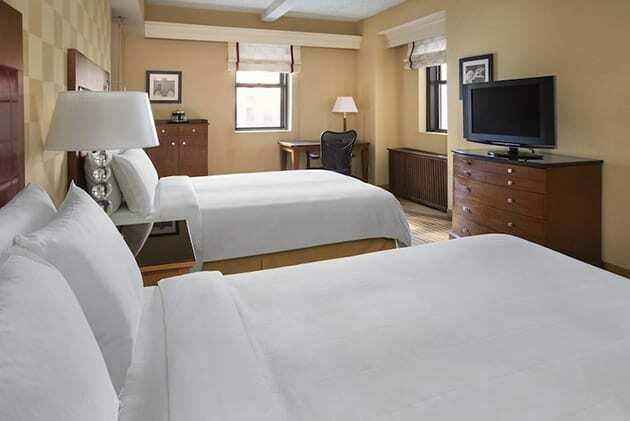 I love the hotel’s midtown location along Lexington Avenue because being an art lover its whereabouts is a direct subway line to many of the museums. The Metro is just a couple of blocks away creating easy access to many of New York City’s tourist attractions. Even Grand Central Station is within walking distance. The staff caters to your needs. My favorite story was in 2012 when I stayed at the hotel, my purse broke. The front desk manager could not find a place to repair my purse repaired so instead purchased a new handbag for me. That same trip one of the hotel’s boilers went out on one side of the building. A group of us clad in hotel bathrobes were escorted to the other side of the building to shower and dress in another room. This trip a basketball net welcomed newly arrived guests in the lobby. How about shooting some hoops while waiting to check in. A pleasant diversion from the norm, it also kept the staff on their toes. My stay included access to the M Club. 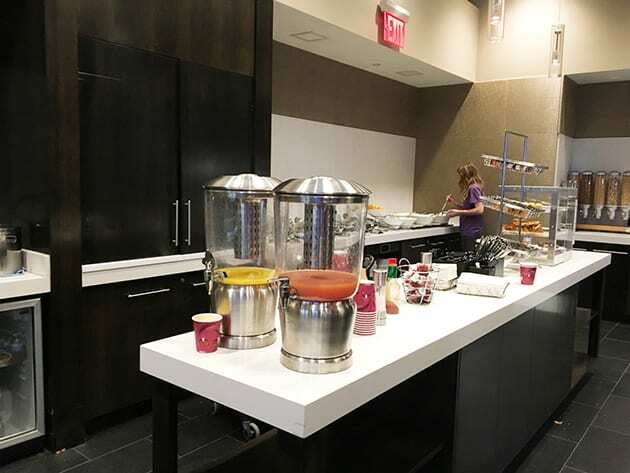 I took advantage of the breakfast provided as well as the afternoon snacks. There is a Napa Technologies wine dispenser also. 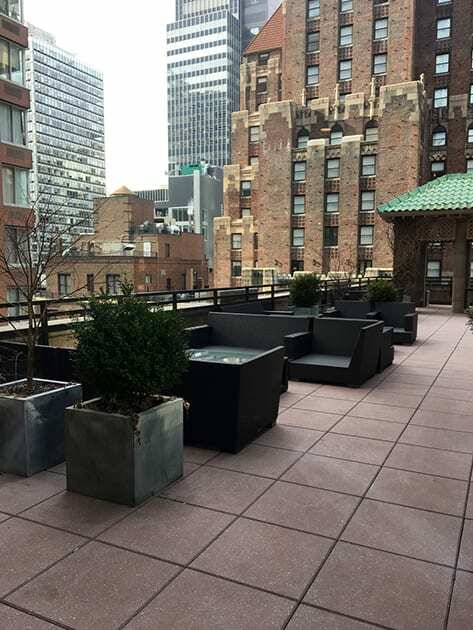 The hotel features the 525 Lex Restaurant & Lounge, but nearby one can also find great cuisine. I ventured to Toscana49 and Avra Estiatorio, a Greek and Mediterranean restaurant. 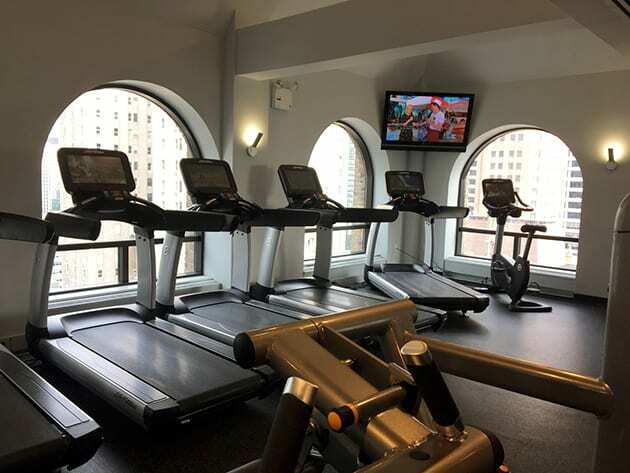 The hotel also features a top floor fitness center with panoramic views.